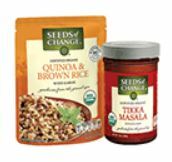 Free Seeds of Change Organic Rice or Sauce Product!! Fill out the short survey form HERE to receive a coupon for a FREE Seeds of Change organic rice or sauce by mail! One FREE product voucher per household. Please allow 6-8 weeks for arrival. Can’t wait to try the organic rice.